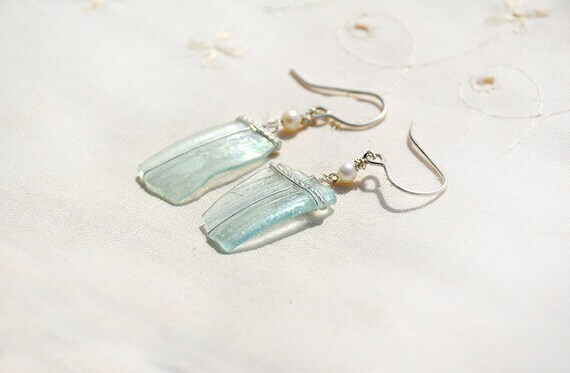 Each of these delicate earrings features a thin ancient Roman glass shard. I individually hand wrapped each shard in a minimal way, with thin Silver wire, and twisted Silver wire, and embellished each earring with a small pearl to create this delicate pair of earrings for you to wear and enjoy with. The provenance of these glass shards is Israel, the Holy Land. Overall drop of earring is around 4.2 cm. or around 1.6535433”. Folksy :: Buy "delicate fairy decoupage card"
Silver Crescent Earrings,Hammered&Perforated,with Ancient Glass Shards.